The Nuremberg Rallies are the quintessential example of Nazi propaganda. Nowhere else is the full panoply of Nazi propaganda as striking. By 1938, attendance was nearly 1,000,000. Each rally lasted a week or more, and brought together every leading Nazi. They are most familiar through Leni Riefenstahl's film of the 1934 rally, Triumph of the Will. To commemorate the events, the Nazis published a variety of books. 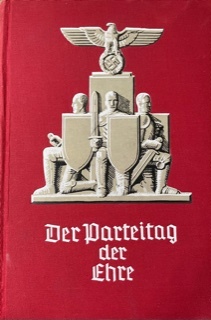 The six-book red series was published by the Nazi Party publishing house. These were normal-sized books. I have translated about a third of the 1936 red volume. Its cover is to the left. There were also some leather-bound editions of this series. There are also six volumes in the blue series, published by the Vaterländische Verlag in Berlin. 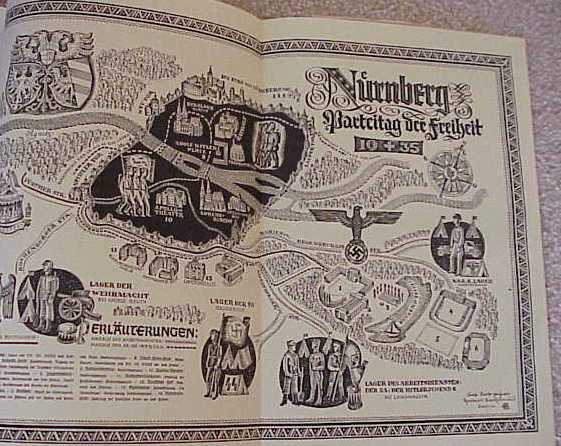 The first two volumes were published under the auspices of Julius Streicher, Gauleiter of Nuremberg. The last four were put out by Hanns Kerrl. The volumes average 350-400 pages. Each includes a hundred or more photographs. The 1934 volume is particularly interesting, since it includes individual photographs of all of the top Nazi leaders, including the Gauleiter. These are large books, weighing about five pounds each. They are printed on glossy, high quality paper, intended to preserve the event for the ages. Books in both series are individually relatively rare. The 1933 and 1934 blue volumes are easier to find than the later ones. 1935 and 1936 seem to be the most common in the red series. I've not sure why that should be, since attendance increased with time, which would lead one to expect more copies were sold. But that doesn't seem to have been the case. The pictures are usually in black and white, but there is a full page color painting in the 1934 blue volume and three color photographs in 1938 blue volume. There were also smaller paperback books of photos put out by Heinrich Hoffmann. I currently do not have copies of either series for sale.